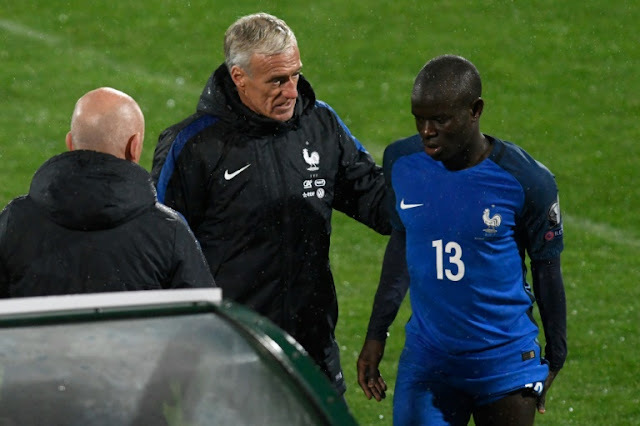 France coach Didier Deschamps (C) consoles defender N'golo Kante after he was substituted with an injury during the World Cup 2018 qualifying match against Bulgaria at The Vasil Levski Stadium in Sofia on October 7, 2017. LONDON - Chelsea manager Antonio Conte says France midfielder N'Golo Kante will be sidelined for three weeks after suffering a hamstring injury on international duty. Kante was forced off in the first half of France's World Cup qualifier against Bulgaria last weekend and Conte expects him to be out for the rest of October. "Kante is going to do another scan next week to check if his situation is improving. From the previous scan, maybe he will be out for around 20 or 21 days," Conte told reporters on Friday. Kante, who won the PFA Player of the Year award last season, will miss Chelsea's Premier League trip to Crystal Palace on Saturday and could be out for another five fixtures this month. That would include two Champions League dates with Roma, Premier League matches against Watford and Bournemouth and a League Cup tie against Everton. Conte admitted Kante's absence is a big blow as Chelsea head into a busy period, especially as England midfielder Danny Drinkwater, signed from Leicester in August, is also injured at present. "In Kante's situation you have to have another scan to understand the situation very well," Conte said. "He is a big loss for us because we know very well the importance of Kante to our team and we don't have another player with his characteristics. "Danny is progressing well but is not ready yet. We must have patience with his calf problem. We may have to adapt some defenders into midfielders." Fourth placed Chelsea are six points behind Manchester City after the champions lost 1-0 to the Premier League leaders in their last match before the international break. Adding to Conte's injury woes, Spain striker Alvaro Morata will miss the Palace match with a hamstring injury suffered against City. Morata didn't play for Spain over the last fortnight, but Conte hopes he will return to face Roma at Stamford Bridge on Wednesday. "I hope to have Morata back very soon, I hope for the next game," Conte said. Chelsea manager Antonio Conte says France midfielder N'Golo Kante will be sidelined for three weeks after suffering a hamstring injury on international duty.